Polish up your coding skills with this practical workbook! 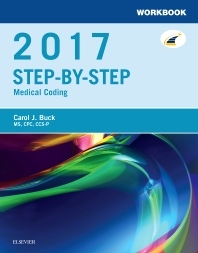 Corresponding to the chapters in Carol J. Buck's bestselling Step-by-Step Medical Coding, 2017 Edition, this workbook offers coding review and practice with more than 1,200 theory, practical, and reporting exercises (odd-numbered answers provided in appendix), including 100 original source documents to familiarize you with reports similar to those you will encounter on the job. It’s a complete review of all current coding sets, including ICD-10-CM, CPT, HCPCS, and inpatient coding! UNIQUE! 100 real-world coding reports (cleared of any patient identifiers) provide experience with reports similar to those you will encounter in practice. UNIQUE! Theory, practical, and reporting exercises help you master key concepts and apply your knowledge. Answer format is the same as that in Buck’s Step-by-Step Medical Coding text, using the multiple code icons, helping you develop your coding ability and critical thinking skills.